The transatlantic slave trade reached its peak between the 17th and 18th centuries spurred by the growth of large plantations in North and South America. 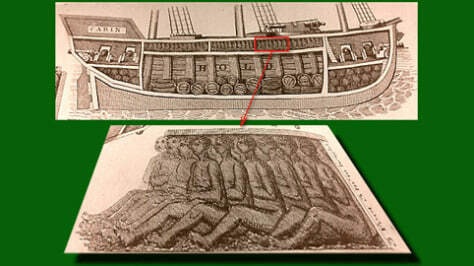 To increase profits, slave ship owners divided the hull into multiple decks, so that they could transport as many slaves as possible. The conditions were horrific and led to incredibly high mortality rates. The slave ship Henrietta Marie, which sank off the coast of Key West, Florida, in 1701, carried up to 400 slaves in a single voyage, with some chained to the bow of the ship during the weeklong passage.